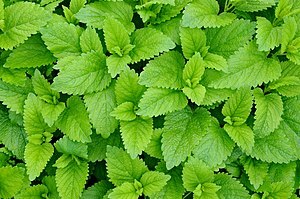 Chlorophyll is responsible for the green colour o mony plants an algae. 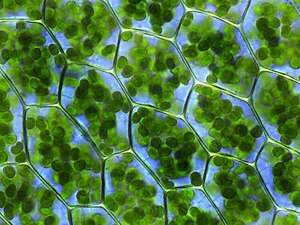 Seen throu a microscope, chlorophyll is concentratit athin organisms in structurs cried chloroplasts. There are several teeps o chlorophyll, but aw share the chlorin magnesium ligand which forms the richt side o this diagram. Chlorophyll (an aa chlorophyl) is ony o several closely relatit green pigments foond in cyanobacteria an the chloroplasts o algae an plants. ↑ May, Paul. "Chlorophyll". University of Bristol. This page wis last eeditit on 15 Mairch 2017, at 23:02.